Here goes the Winning Photographer of the 1st Colorsoflife@university. Congratulations to Ingrid Pfau, student at the University of Alabama at Birmingham for her photo “Ventanas Naturales”. Looking out at a white sky after a cold rain, it is hard to see the entire spectrum of color present from the organisms flying and floating through it. One must focus in on an almost microscopic level to appreciate the detail that every plant and animal has to offer. Ventanas Naturales captures a moment between two dragonflies mating in an unnatural setting: Birmingham’s Railroad Park. 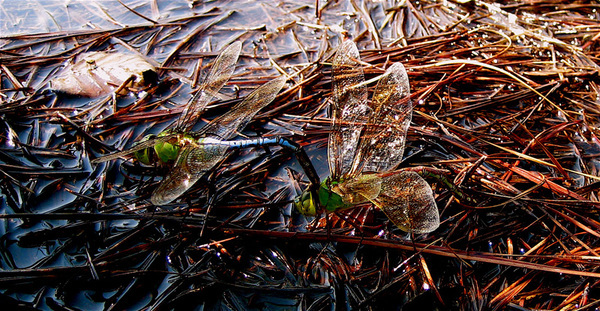 The edge of a man-made pond covered in moist pine straw is the perfect backdrop to appreciate the intricacy of the damp scales that make up a dragonfly’s wings. The triangular “windows” made up of pine straw and water parallel the patterns found in the resting wings of the vibrantly green/blue dragons as they get ready to fly off to a deeper part of the pond to lay their eggs in and successfully pass their genes on to the next generation.